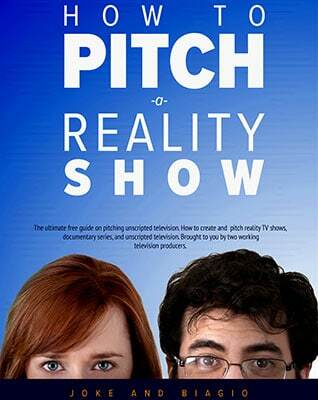 Many people visit this site to learn how to pitch their own TV shows. Today, we give you an inside look at what happens when our production company teams up with an aspiring producer. We met Abra Chouinard through this very podcast and our newsletter. We did not know her before she submitted her concept and package to us. Now, she’s joining us for pitch meetings at major TV networks (and getting great response!) Abra shares the whole process, from pitching to us, to teaming up, making a tape, and meeting network execs. Plus, she shares actionable tips to help you stand out when pitching your first concepts…whether to us or anyone else. With that attitude, it’s no wonder she did everything right when pitching to us. We receive many, many submisions (and are truly grateful to everyone who trusts us with their pitch materials). However, like we say here, we can’t make “all the shows.” No one can. We have to be very selective with which concepts we put our resources into. So what is it that made Abra’s pitch rise above? Why did we immediately want to meet with her? 1. She was pitching a package and not an idea. 2. Abra already had access and permission to film real people and a real place. Both were TV friendly. 3. The pitch she sent included cast bios and a potential story engine. (Not sure why that is? Check out our two free ebooks. 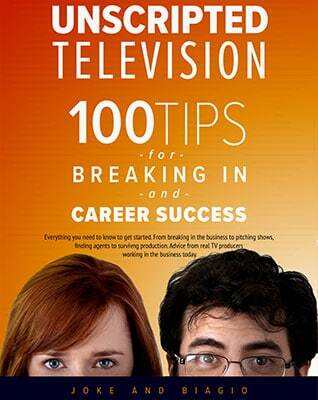 How to Pitch a Reality Show, and our newest – Unscripted Televsion: 100 Tips for Breaking in and Career Success). But Abra had one other thing going for her that made all the difference. Joke and Biagio out pitching with Abra. Abra watched television and analyzed what is currently on air. That taught her where her show might work. No matter how much we love a project, if we can’t set it up at a network, we can’t be helpful. The fact that Abra developed with a target in mind meant we could not ignore her pitch. She understood the tone, style, and content that appeals to her key potential networks. Every aspect of her pitch package reflected that. The little farmer who’s pulling on those seedlings is not gonna make the seedlings grow any faster. All you’re gonna do is kill your crop. From seed idea to TV network pitches, and everything in between, this episode has it all. Abra’s story provides an inside look we don’t think you’ll find anywhere else. It’s the truth about what happens if a production company (ours or any other) wants your project. Quite a list! And there’s so much more to pick up from Abra’s story. If you are aiming to pitch your unscripted TV projects – to us or anyone else – today’s episode is a must listen. Start prepping for your next successful pitch – hit that play button above now! The package Abra brought included a potential Story Engine – What is a Story Engine? Why Do You Need One?